Is it Monday again? Nope it’s Friday and I had the urge to throw some motivation your way. I know its been a while since you guys have seen a Motivational Monday post grace my page but I’m back first thing Monday! For those of you who have been checking for them I promise to be consistent from here on out. Now, I’m pretty sure we all know what “Accountability” is. It’s holding yourself accountable or in other words taking responsibility. Taking responsibility should be like waking up and brushing your teeth, something you need to do. When you decide to take 100% responsibility over yourself everything will begin to improve. Your confidence, relationships, work ethic, etc. will begin to flourish. Your self will thank you and you will thank yourself. You have to develop the mindset of “It’s my responsibility to ensure that I am on track and doing everything I need to be doing, no one else’s“. Why should someone else have to hold you accountable for things that you need to do to improve yourself? While it’s nice to have help, if someone has to remind me of a goal or something I should be doing I feel as though I have failed. I have to be the one to hold myself to a specific standard, hold myself accountable. When you sit down and plan accordingly, reflect on everything, and have a serious conversation with yourself, you leave no room for error. You have to be serious about being serious! Hold yourself accountable by writing things down, setting reminders, taking action now instead of later, and by being clear and concise on what needs to be down and when. Be clear on what you want and how you’re going to get it. Stay organized and put yourself in a winning mindset. 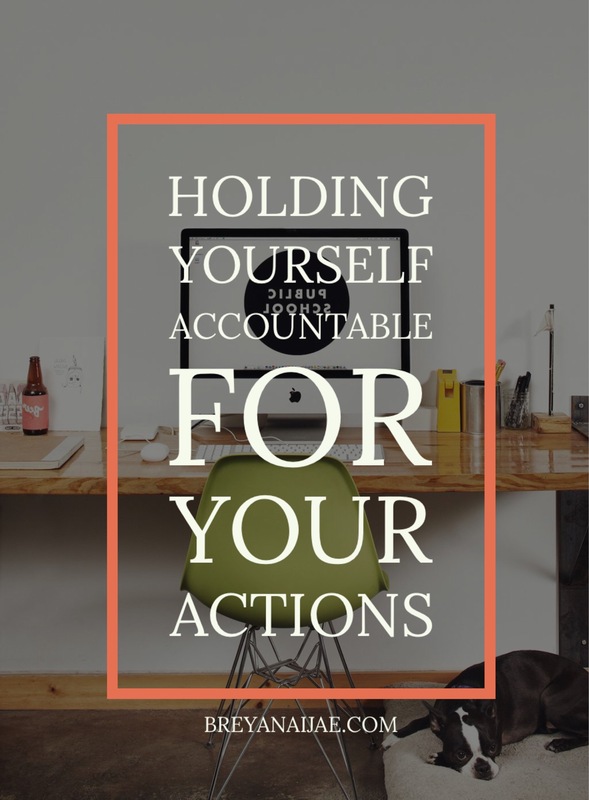 There a various types of accountability that revolve around your responsibilities, actions, choices, goals, etc. When you are personally accountable it means you take full ownership of situations you may find yourself in; there is no shifting the blame. The manner in which you respond to challenges. How you execute goals and plans. How you spend your time. Your attitude and thoughts towards life. Being on time to work and appointments. Keeping track of things to do and staying on track. Putting your goals and plans into action. Today, I challenge you as always to take control over your life and to hold yourself accountable, take ownership of that responsibility. Remember that it’s YOUR life at the end of the day and holding yourself accountable is nothing more than going through with plans and goals you have set for yourself. Don’t get in your own way! Be sure to check out my latest Motivational Monday post on why Self-Care is Important!